Prawn Fritters made with sugar, pepper, rice flour, salt, curry powder, water and slake lime (kapur). Season prawns with sugar and pepper. Sift together rice flour, slat and curry powder. Mix to a thick consistency with water. Heat oil. Add slake lime to batter. Mix well. 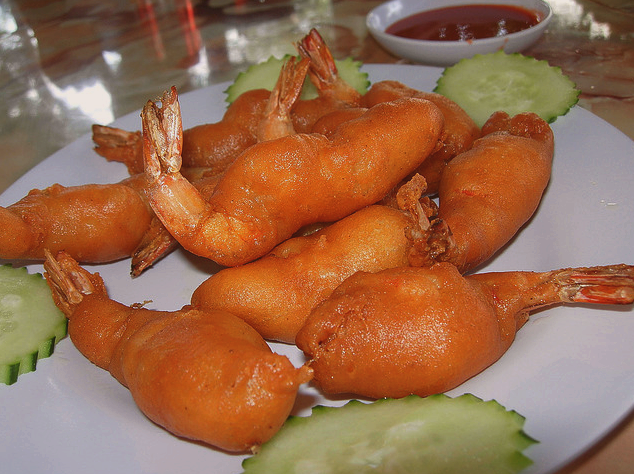 Dip prawns in batter with your finger tips (one at a time by holding its tail) and deep fry till golden brown. Serve with chilli sauce desired. Slices of fish or meat can be cooked using this method. Before read this blog tile first, I thought there are chicken leg pieces. Any way nice idea.